Behold General Maximus of Salus and his vanguard. 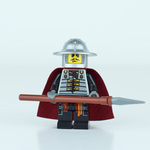 General Maximus is one of Loreos' most famous generals, second only to Mark of Falworth. Practically born in the saddle, Maximus loves to lead a charge of cavalry, but his true skill is as a general. While Mark of Falworth led the main combined Loreos force in the War of Roawian succession, Maximus was his second in command. Maximus was also good at using minimum resources to strong effect, which is why Loreos was able to push so far into Lenfeld and still maintain a firm amount of control on the territory they had seized, and more importantly, keep their supply lines going. Maximus allowed all of this to happen and still have an enormous force at the front. When Mark of Falworth was captured, Maximus took command and organized the withdrawal from Lenfeld. General Maximus' family is an old and wealth one with a great estate a short distance away from Salus. Maximus, while famous in war, has little interest in politics, but is very loyal to Loreos and its prince. His estate is famous for its horses, and when Queen Galainir ordered that Loreos disband its forces, Maximus seemed only too interested. However, he had secretly hidden his and many of his men's arms and armor within secret chambers on his family's estate. And naturally he would never get rid of his horses. When Mark of Falworth called for the Loreos heavy cavalry force to form once again, Maximus was able to send a large company of knights to Mark's side. Maximus himself stayed to help with the rebellion efforts. Now, with tensions high, Maximus has summoned his army together for whatever may come. 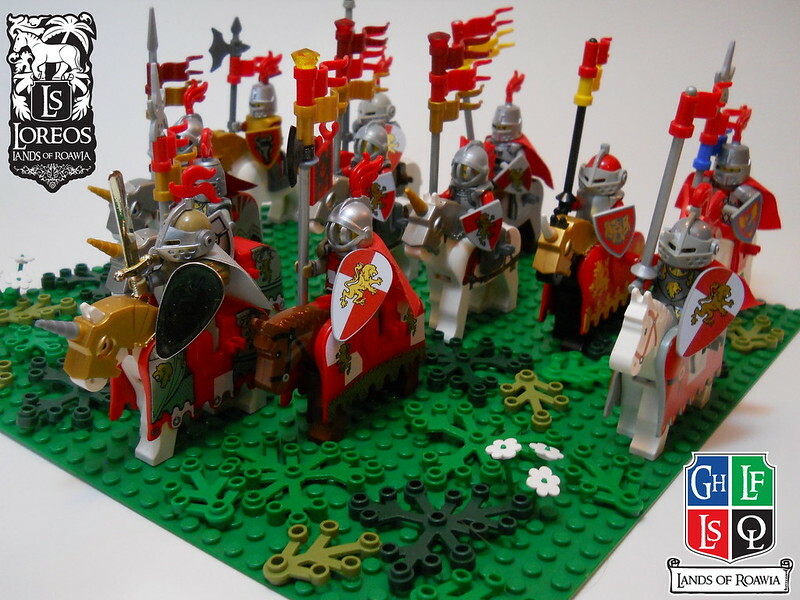 Pictured here, General Maximus leads in his silver and gold armor accompanied on either side by his two sons and surrounded by his commanders and friends, ready for whatever may come, for the glory of Loreos! First I wanted to thank Ayrlego for helping me out with the picture. Second, as a Lenfeld, I don't know how much I should publicize the fact that I had lots of fun building Loreos heavy cavalry. Each knight has a different theme, with the exception of the two standard bearers. The unfortunate thing is that the details are kindof hard to tell from this angle. 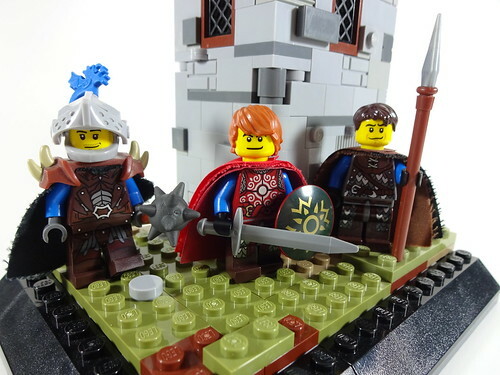 I may do a different arrangement in the future to better show off the minifigures and post it to the Loreos faction thread. It was lots of fun mixing and matching color schemes in different ways! My Wildcard entry is also for the Glory of Loreos! The market city of Oasis is a hidden gem in the vast desert of Loreos. Bordered on two sides by matching oases and surrounded in high brick walls, this lush landscape has provided ideal scenery and a bustling marketplace to the various nomads, merchants, and knights of the southern faction, none more widely known throughout the city than Sir Fancymus Whitegrin, the Golden Dragon of Oasis. One of the youngest Loreesi to become knighted by the Prince, Fancymus has won great renown in local jousting matches and more importantly - to him, at least - a reputation as quite the ladies-man. Though some have begun to find it in poor taste with the rise of the Dragon Knights of the Shade, the golden dragon that is his insignia has been passed down through his bloodline for generations and Fancymus isn't one to be easily swayed by the opinions of others. Now, setting out from Oasis with his nephew and faithful squire Escerious Whitegrin at his side bearing his banners, Fancymus is ready to face whatever challenges the rest of Roawia has to offer. 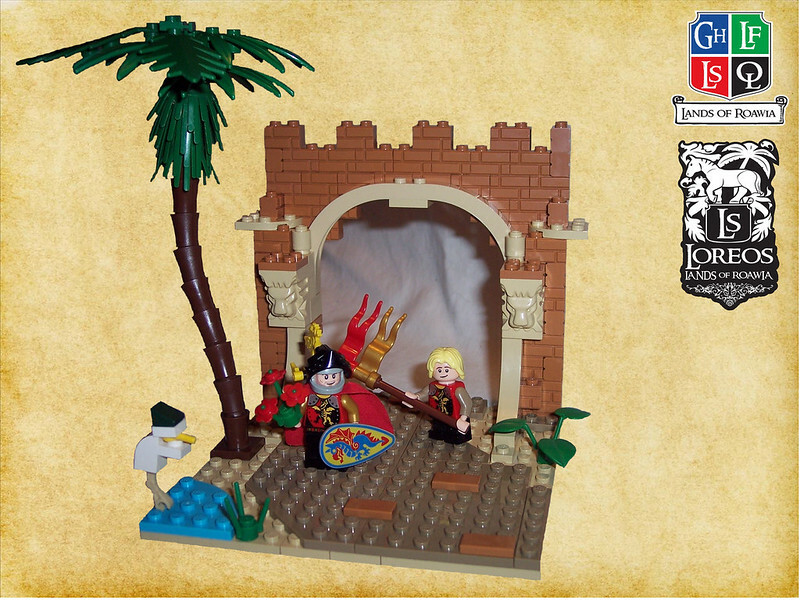 Eastern Watch as vignette entry. 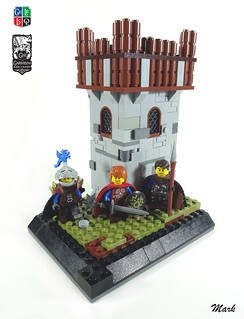 The men of the Eastern Watch guard the eastern coast of Garheim. Though seeming like a dull occupation, these men have been in many battles to keep smugglers and outlaws off the mainland. Mark of Siloam I have been repeatedly impressed when someone uses those spiked shoulders for someone who isn't evil and it turns out great! Nice figs! I'm really impressed by the use of the red LotR torso with blue arms. Never in a million years would I thought of putting blue arms on that torso - dark green, sure, I do that all the time - but blue? Yet it looks fantastic! Great combos Mark of Siloam! Great entries everyone! Still plenty of time to get some more in. I'd encourage everyone to at least try for a Bignette! 16x16 is relatively easy to do and the more entries the better! 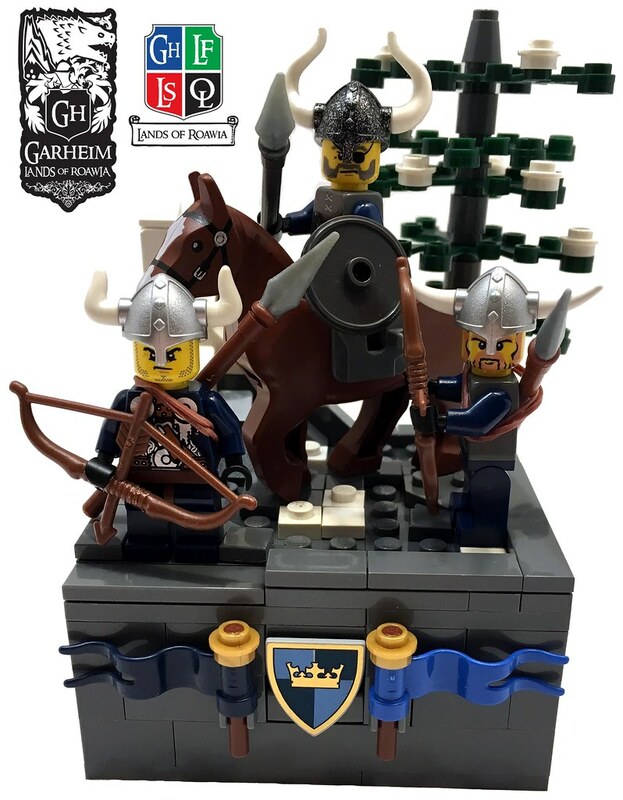 Led by Sir Gunter Wulfsbane, The Silent Hunters are a group of veteran knights, rangers, and ex-military archers tasked with defending Garheim's northern borders. Based out of Silverstone Keep, these special forces soldiers are known for bringing down enemies without being seen, hence their name. Some other prominent knights include Lord Meric Deerstalker and Sir Mikken Clawhelm. Lord Vidar Norgard, master of the coin of Jahrton. He is the second son of Steinar and in charge of trade agreements as well as making sure resource make it's from the surrounding countryside to the city. Lord Vidar’s son, Sweyn Norgard, is a part of the Jahrton Grey Company. He is the current head of the merchant’s guild which is responsible for getting the rare goods from both Lenfald and Loreos. Rumors have it that he deals with the underworld and has connections in every city with Lenfens, Loressi, and even outlaws. Lord Rurik Norgard, general of all armed forces of Jahrton. He is the eldest son of therefore the heir to the lordship of Jahrton. Rurik is married and his two sons Haakon and Sigurd who are in the armed forces as well. Haakon is part of the Jahrton Grey Company. Sigurd is captain of the Jahrton pike men. Rurik's jobs are not limited to military responsibilities but also include coordinating with villages and hamlets to send guards to protect. He is also in charge of providing training for both armed forces and militias. Lord Jokum Agnor, captain of the ship The Freyjord. He is cunning, has a knack for exploration, and knowledge of ships. 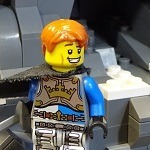 He is vying for the position as admiral of Jahrton's navy by creating a navy that is up to date and functional. His competition is Guttorn, youngest son of Steinar. The Unmentionable One: We don't talk about him. The Wrangler: He treats horses better than people. He hates horses. *Will not be held accountable for collateral damage. 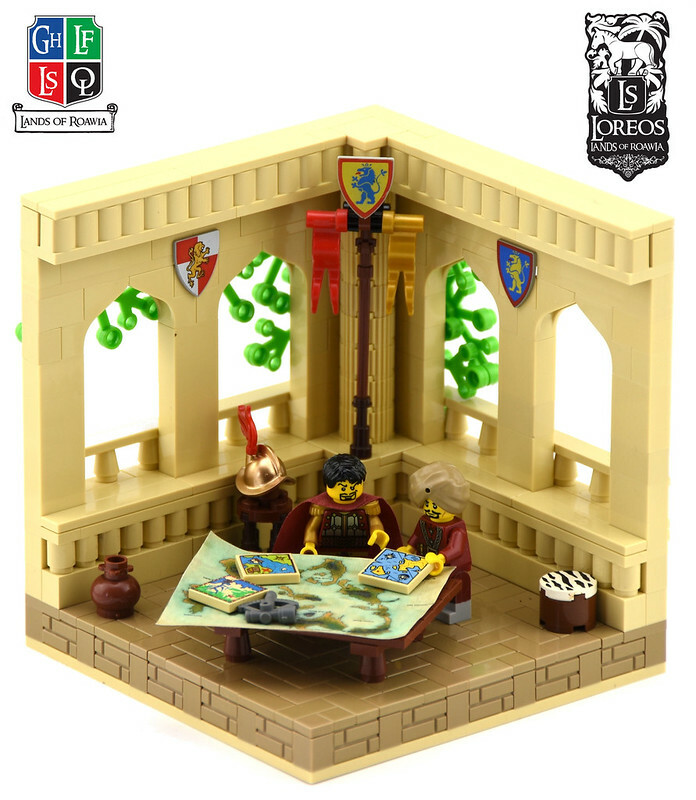 "Your scene should be between 2-5 minifigs on a small simple landscape." Would a small simple interior - i.e. no walls - count too? Meet the Jahrton Grey Company. 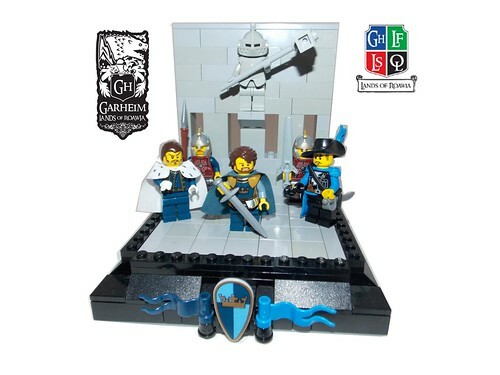 The Jahrton Grey Company is a group of rangers based out of Jahrton. The company is comprised of three squadrons. Each squadron is led by a lieutenant and has its own specialty. The ranger company is currently led by Bjorn Strörmbert. The reason for grey in their name is not that try wear grey cloaks but rather it is because they stay neutral in any affairs that they are a part of. Their motto is "Grey is for those willing to be molded". All squads protect the land but also act as judge, jury, and executioner to thieves, murderers, and outlaws. They have become the law outside of the city of Jahrton and the surrounding hamlets. They do assist local hamlets with training new rangers as well as hunting down fugitives. The men recruited are some of the finest families and best abilities, but they do not turn away anyone who wants to join. Their condition is simple, recruits must be willing to be molded and changed. While a simple request, not many people are willing to give up everything to join the Grey Company. The 1st squadron is nicknamed the "Lone Falcons" tend to form small raiding parties of 3. They are used as scouts for any army they are attached to. 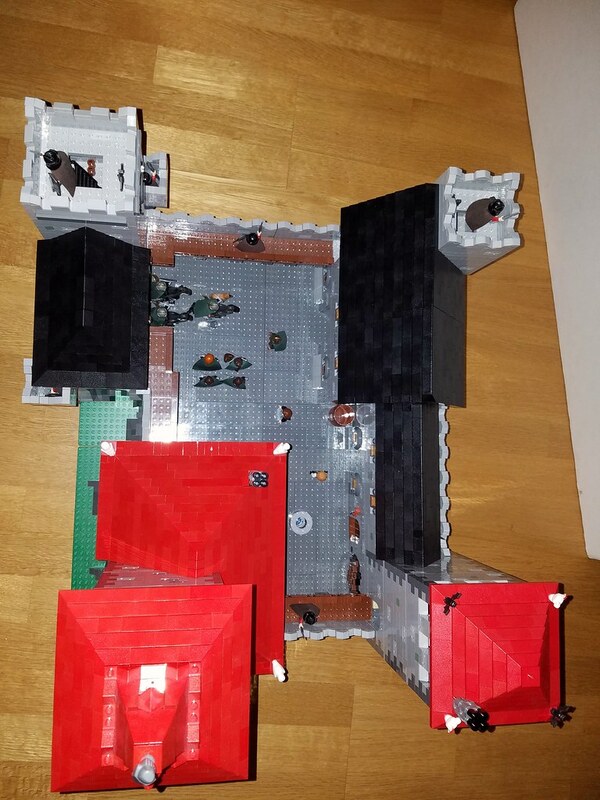 If they are not attached to an army they are scouting the area around Jahrton dealing with any outlaw bands they see or hunting down any people who threaten the Lord of Jahrton. Due to the small groups that they work in, they tend to answer directly to the ranger commander. The 2nd squadron is nicknamed the “Wolf Pack”. They are the largest of the platoons and tend to form groups of six or more in order to accomplish given missions. They are known for their large fur hats which can give off the appearance of a wolf's head. When they are attached to an army they provide scouting and cover fire for the main army. When not attached to an army, they provide protection to important individuals as well as protecting the land around Jahrton. They are currently led by Bjorn along with his sergeant Haakon. The retirement of Magnus from ranger commander has led to Bjorn both leading the 1st squad and leading the ranger company. The last squadron is the 3rd squadron; they are nicknamed the "Sniping Royals". 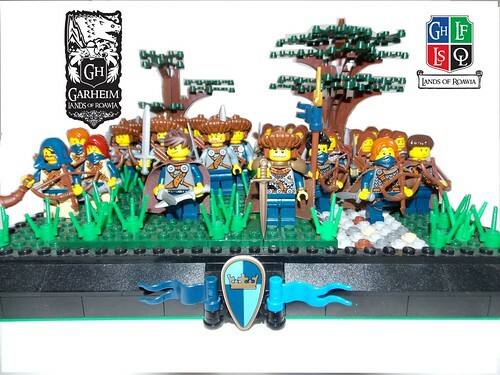 They are master archers and go out in groups of 5 or less. The Falcons are rangers that utilize long range sniping tactics. They are strictly an archer attachment to any army they are in. There have been times when members of the 2nd and 3rd squads are grouped together to accomplish missions. Like 2nd squad, they patrol the areas around Jahrton hunting any beasts or outlaws that threaten the land or roads. The 3rd squadron is led by its three sergeants, Eirik, and Sweyn. Due to the death of Lieutenant Grunyar, these three have led the squad for the past four months. An interior would be perfectly acceptable, in fact I'm doing an interior myself! Sir Hugh Calpho fits the ideal of a chivalrous knight to a T. His concern for honor descends to the minutest particulars; he has been known to fast for hours when no food suitable to his rank is available, and once, when his own clothes were torn, he stayed in bed for a whole day while his squire fetched another suit that would not be beneath him. But by equal token, Sir Hugh would rather bite off his tongue than say a falsehood. Arthur Hanock is Sir Hugh's young squire. He is merry and carefree, but wonderfully quick at guessing the knight's thoughts and anticipating his commands. Following a long leave of absence, The Great Horsegiver Giscu-uru has returned with a modernised Skudae army. Giscu-uru (left) rules his tribe ruthlessly - don't let his progressive views fool you - he murdered his brother bare handed at a feast to take control of his tribe, and few question his fitness to lead. 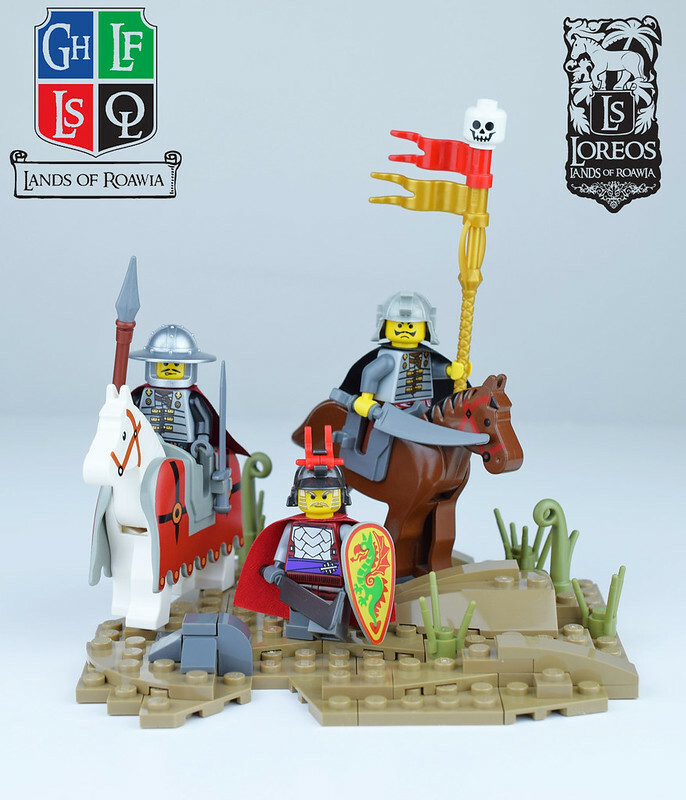 His standard bearer Oghuz (right) also wears flexible Loreesi armour and carries the fearsome golden skull standard that Giscu chooses to represent his people. Carrying the wicked curved sword the Skudae are famous for, Oghuz protects the standard with his life, knowing that if he loses it his life is forfeit anyway. On foot is Hirgu (centre) - one of the tribes old guard of warriors, his shock decision to lead the tribes infantry helped Giscu convince many of the older warriors to participate in his modernisation programme. While many others still ride bare chested, Hirgu wears metal armour and (unusually for a Skudae) carries a shield. His infantry carry heavy hacking swords used to crush the plate armour worn by enemy knights and heavy infantry. Giscu's tribe are ready for whatever challenges are thrown their way!
. &nbsp;The name comes from the tower in its southwestern corner. It is also at times called by the locals as Kaszebe, though that is a very informal name as it really is the name of the region. The keep sits in the mountain region and is built on solid bedrock. This makes it very defendable. 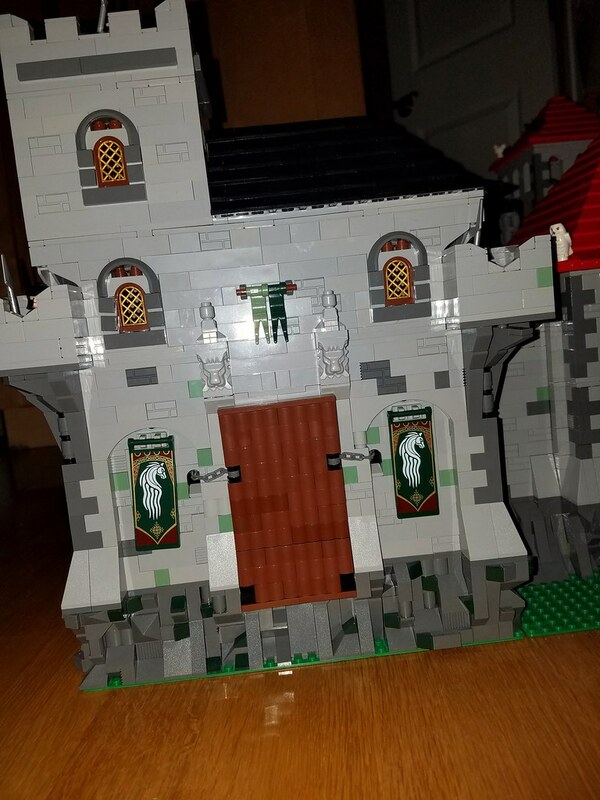 Some keeps have been built out over the years making them bigger and bigger but the lords of Wiezyca never saw the need to built out the keep. Inside the keep there is a natural spring - supplying the inhabitants with very tasty water for drinking and brewing. The keep is famous for its beers and ales. Some also claim that there is a secret entrance from the keep to the mountain cave system but noone can point to any caves or secret entrance making this claim more of an old wives tale. The main entrance of the keep is adorned by the Lenfel colors. &nbsp;Granted the yellow is very odd green colored but that's because the color blind stable boy has washed the yellow flag with the green one and the result is hanging. &nbsp;As Ke'JRu is entering the keep he can't wait to give his cousin - Sir Kejtar hard time about the flag color. Captain Alfonso de Rojas, a man of many talents, is known as a mariner, warrior, scholar, artist, cartographer and explorer, and is one of the leading Loreesi figures in the exploration of the great western isles. Whilst Loreos is known mainly for its armoured knights and heavy cavalry, scorching deserts and nomadic tribesmen, it should also be remembered that it is a place with a deep tradition of education, innovation and the arts. Not all Loreesi heroes ride a horse… or camel… or elephant! Originally a younger son from a wealthy merchant family, he trained as a ships captain before a youthful spirit of adventure saw him fighting as a marine. After a number of years at sea, he discovered a talent for drawing which led to a study of cartography. His early work included several successful surveys of sections of the uncharted Outlaw coastline (during which he also fought in many maritime skirmishes). He also became renowned for his sketches of the flora and fauna of the minor islands in region. With the announcement of the Lenfel discovery of the great western isles, he was on of the first Loreesi captains to make it through to the isles and has since successfully led several expeditions, being responsible for much of the detailed mapping of the coastline of Ad Undas. In recognition of his work, he has been granted command of several vessels and a crack company of Loreesi marines, many of which he hand picked from his previous voyages. The purpose of this command is to continue exploring the new world and to further advance Loreesi knowledge and influence in the region. Seen here in one of his return visits to Dalmunutha, the very highest levels of Loreesi leadership seek his advice in matters of the new world. The Princes of Loreos have requested an appointment, they seem quite interested in the island of Frydraca, the latest claim in the new world by rival province Lenfald! Here Alfonso and his right hand man, Rashid al Maari study their maps in preparation for the visit. Rashid, originally from one of Loreos many desert tribes, is one of the few tribesmen to take well to the open water. An excellent navigator, he claims there is little difference in the stars whether in the middle of a desert, or an ocean! Whilst he is a skilled cartographer in his own right, the map Alfonso is using here appears to be suspiciously Lenfel in origin!